You and your team are all STARS !!! We are very satisfied working with you personally and your company in general. Your proposals come to us shortly, including all needed information. The translations provided are with high quality, you always keep the time line, no minute delay. We are very satisfied with the manner you are dealing with our requests and we also appreciate very much that you have never had any delays in delivering the needed materials. Thank you for your correctness and for your promptitude. We have tried several translation companies and so far your services have exceeded our expectations. Your translators have always been able to cope with the pressure and continuously deliver quality translations and excellent service. What has impressed me most has been your translators' concern for consistency and accuracy. I have often provided you with glossaries and support materials to use in the translations and these have been followed faithfully. I would be happy to recommend you to anyone else looking for a fast, reliable and high quality translation service. Our needs were accommodated to perfection. The end product was of a very high standard and has been well received by our clients. I certainly wouldn't hesitate to use London Translations again in the future and will recommend them highly to others. We had 52 speakers and 250 delegates from all over the world participating in our conference. You were able to provide excellent support at all stages of the process. The feedback that we have received from delegates about the organisation of the conference has been extremely positive. 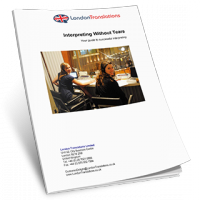 From initial contact through to the follow up after the event, the service we received from London Translations was second to none. The personnel that were supplied on the day were all very professional and the service they provided was crucial to the success of the meeting. 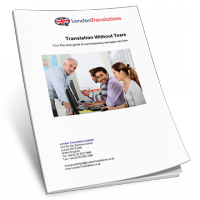 We have used London Translations now for a number of projects including our main corporate website and a wide variety of brochures and other marketing materials. You have always met our needs and have always delivered promptly, in time for our deadlines. Thank you so much for your quality work, attention to detail, and quick responses to our questions on all our jobs. We are all very impressed and will continue to hire London Translations for all our future translation requirements. Several delegates commented on the standard of the interpreting and it was a model of how smooth and professional it should be. But it was more than that. The preparation was excellent - everything in place and working properly in good time. I asked an ex-colleague of mine to check it over as we were very concious that we wanted the website to look like a German website and not a translated UK website. She is a native German and works in the Telecoms industry. Her comments were that it was an extremely good translation and it was perfect German business language. Just a short not to say "Thank You" for London Translations' outstanding service in view of our ad-hoc requests and your timely responses and quality of work provided. Thank you for consistently providing a professional service delivered on time, without fail. Your attention to detail and stellar customer service standards are outstanding. I would not hesitate to recommend your company to others. We were very pleased with the French interpreters. They were very flexible and willing to go with our participants to different workshops rather than being in one workshop as I had originally planned with your agency. This piece of translation was vital for part of our works on one of the biggest construction sites in the UK. Other companies contacted had said that the translation would not be received back until Monday at the earliest as it would have to be worked on over the weekend. When they proofread your translations all commented on the way the translators had captured the spirit, as well as the letter, of the text we supplied you with. I am writing to express my company's satisfaction with the services recently provided by London Translations Limited. We were desperate to provide our overseas client with a quick understanding of its competitor's latest promotions. The customer service and speed of delivery was exceptional and our partner in the Netherlands was complimentary about the accuracy of the translated report for our European Commission Funders. Superb service and a lightening fast turnaround for our audio marketing operation when we need English translated into Urdu or any other language for that matter. It's great to know that we have found a company that is reliable, fast and easy to deal with. The fact that you were able to answer all my questions and my clients concerns regarding printing was very reassuring. I would highly recommend yourselves to anyone that needs translation or DTP services. Thank you for your time and efforts in interpretation during the Olympic Seminar as part of the recent All China Lawyers Association visit. We couldn't have done the seminar without your help and tireless skills!! I am amazed you were able to turn the job around in less than an hour at a fraction of the price others were quoting for several days's work. I would like to thank you for the professional and expert handling of a rather tricky technical translation. Your service, professionalism and attention to detail were excellent and I would not hesitate to recommend your company to others. I would like to take the opportunity to thank you for the invaluable help during our recent technical training seminar for representatives of our distributors in Japan.